Notting Hill Gate is important to us residents of St Helens, as a place to shop, see a film, or have a meal. Many people living in these streets were drawn towards this area because of its relative proximity to Notting Hill Gate, which has always been seen as an interesting, creative, and slightly bohemian part of London (long before Hugh Grant and the film gave it global recognition). RB Kensington and Chelsea has been consulting recently on a planning framework for the Gate. The area was comprehensively redeveloped in the 1950s, as part of a road widening scheme by the London County Council. Some of its office buildings date back from that period, and others from the 1960s and 1970s. Most are now outdated. Several landowners have property holdings in the area, and have been putting together redevelopment proposals. The largest of these is for Newcombe House (the tall block above Waterstones) and includes the row of shops and restaurants on the west side of Kensington Church Street. The council’s new draft Supplementary Planning Document for Notting Hill attempts to set some parameters for redevelopment, in terms of building heights and densities. It also contains proposals for upgrading pavements, public areas, and the entrances to the Underground. The council’s ‘vision’ for Notting Hill is to retain its role as a ‘district centre’ for shopping and offices, and to improve the public realm for all those who use this very busy public transport hub – including the many tourists en route to Portobello Road. 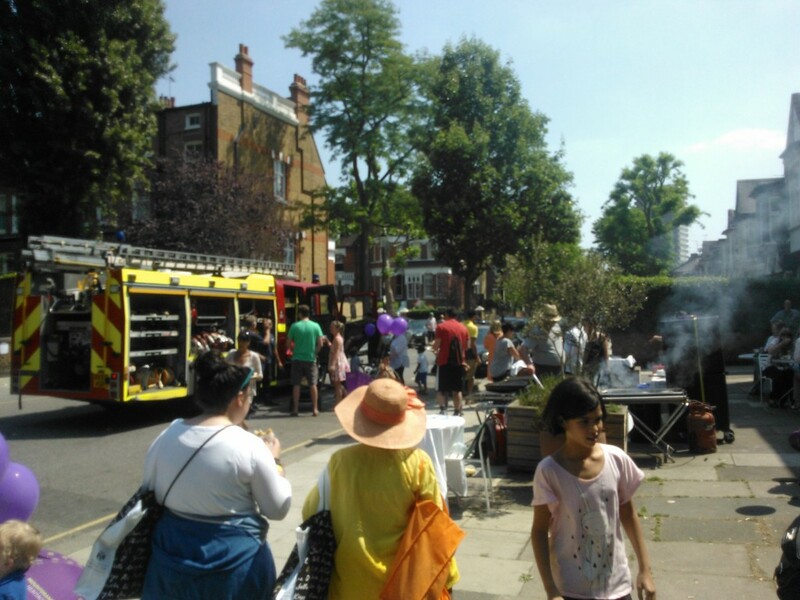 In recent months the Kensington Society has been working with resident and amenity groups in the area (including St Helens) to refine some of the council’s initial proposals. 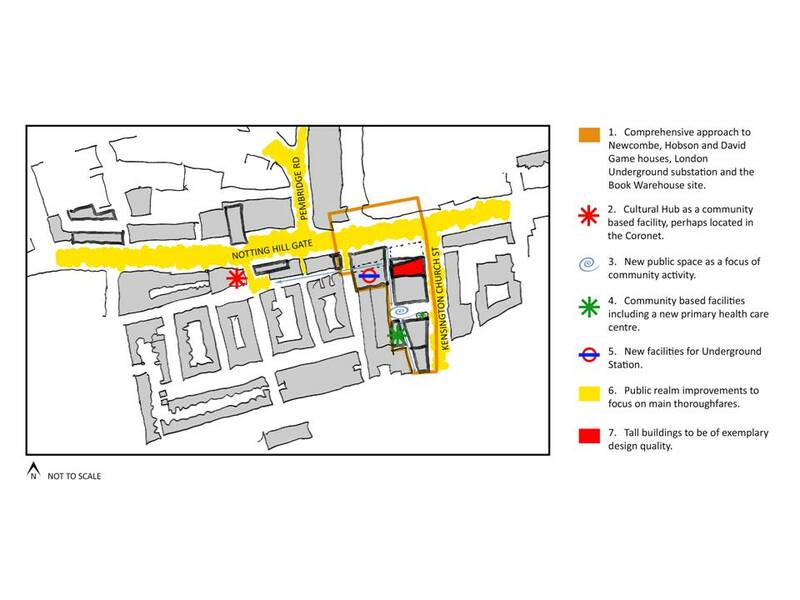 In particular, the Society has argued that one of the RBKC ideas – that of using £8m of ‘planning gain’ to provide a 2,000 sq.m space for a museum or ‘cultural hub’ was not attracting much local support. The Design Museum is already relocating to the former Commonwealth Centre in Kensington High Street, and does the borough need another museum space which might turn into an expensive ‘white elephant’. The Kensington Society view, which has been widely supported, is that this £8m of public funds could be better spent, and could in part be used to secure a new public square, within the redevelopment of Newcombe House. This is seen as giving the area a much needed focus, sheltered from the windswept main road, and an attractive locatiion for shops, cafes and resturants (as well as the Farmers Market). The redevelopment of Duke of York Square, off the Kings Road, is cited as an example of creating successful open space within a new retail development..
An issue likely to prove contentious once planning applications are submitted is the height of redeveloped buildings. Developers will be looking to build high, in order to maximise profitable floorspace. The owners of Campden Hill Towers would like to adds another couple of storeys. The developers of Newcombe House has shown plans which include and office and residential tower half as tall again as the present building. The council generally has strict policies on tall buildings, but will allow them in district centres maximise where they are claimed to provide a ‘landmark’ building of high architectural quality, Residents of Hillgate Village wait to be convinced. 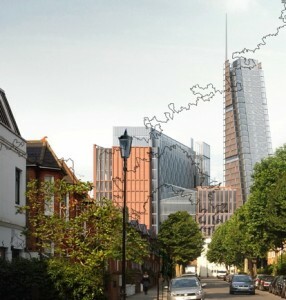 Having listened to the views of the Kensington Society and other groups, the council has shown some willingness to modify its original plans. It will not be publishing the final version of the Noting Hill SPD until after the May elections, and may consult further before doling so. This proposal from the Alpha Plus Group of schools has been around for a year or so. A previous planning application was turned down by RBKC. A revised application was submitted a couple of months ago. We asked all our membership for a view on this controversial planning application to relocate Chepstow House School to Bassett Road. The main concerns raised were in relation to traffic, parking, and the road safety issues on the junction at the mini-roundabout on St Marks Road/Bassett Road. Along with potential noise nuisance for those in neighbouring houses and the fact that the building at 49 Bassett Road is too small for a school of the size proposed. On the basis of this response, the association sent in a letter of objection to the planning application. The main concerns, as with the earlier application, were in relation to traffic problems, road safety at the junction and mini-roundabout, and potential noise nuisance to neighbours. We understand that letters of support and objection (of which many hundreds have been sent into the council) have been in roughly the same ratio as your votes. The council’s Planning Applications Committee will make the final decision on the application, in the next few weeks. Hammersmith & Fulham Council on October 23rd will be adopting the final version of the White City Opportunity Area Planning Framework. This will become a Supplementary Planning Document to the borough’s Core Strategy, and will be taken into account when decisions are made on planning applications for sites in the Opportunity Area. The document has been through two rounds of public consultation, one in early 2011 and one in mid 2013. In the long interval between the two, the council granted planning permissions to developments on most of the key sites in the Opportunity Area. These included the Imperial West scheme (with its 35 storey tower), the Helical Bar scheme (32 storey tower) and the next phase of Westfield (20 storey tower). In response to both consultation exercises, local people said they did not want to see very tall towers in this part of London. The idea that it was somehow ‘appropriate’ to build a cluster of very tall buildings alongside Westway, as a ‘gateway to London’, has been widely derided and received no support in the consultation responses sent in the council. Has the council taken any notice, in finalising the planning framework due to be approved next week? The overwhelming concern expressed relates to guidance in theWCOAPF regarding building heights. Whilst there is some support for more flexibility regarding where tall buildings can be located in the opportunity area the majority oppose the building heights as being excessive and express concern regarding their impact on surrounding areas especially the impact on conservation areas. Of most concern are the two towers proposed in the indicative masterplan on either side of the Westway and their detrimental effect on the skyline and their impact on local residents to the north and east including residents in RBKC and the Stable Way traveller’s site. Slender towers of approximately 21-30 storeys (up to 100 metres) would be appropriate along the Westway has been changed to read Slender towers of approximately 21-30 storeys (up to 100 metres) could be appropriate along the Westway. Answer – because the council knows that buildings of this height have stretched national and London Plan policies beyond their legitimate limits, and they do not wish to acknowledge this in what will become part of the Borough’s statutory planning framework. Note that this change has been made as the final outcome of a two-stage consultation exercise in which the responses from the public have said the complete opposite to the thrust of this revision. So that is it. A long-drawn out process of public consultation on a strategic planning document, spread over several years and costing large sums of public money, and these are the end results? This is why the general public has lost faith in the planning system, and in consultation processes that are required by Parliament but which can be rendered meaningless in practice by a council that wants to get its way. The council made up its mind several years ago, in close dialogue with developers, about building heights in White City East. It has refused to listen ever since. The one hope now is that Imperial College may prove a better listener. The College has acquired the former Dairy Crest site on Wood Lane, so the prospect of the Helical Bar scheme being built on this site is now past history. The College has appointed the international firm of Skidmore Owings Merrill to prepare a new masterplan for what is now a combined 22 acre site. There is the prospect of a much more coherent plan, with better buildings, emerging to replace the currently approved schemes. The College has shown a recent willingness to talk to the Hammersmith Society, the St Helens Residents Association, and the new St Quintin & Woodlands Neighbourhood Forum, at an early stage in this new masterplanning exercise. A revised set of proposals could create a university, health, and science innovation complex of world class renown, and one that sits well alongside its residential neighbours. But this will need the council to join with the College in showing greater respect to the voices of local people. Kensington and Chelsea Council has now formally ‘designated’ the new St Quintin and Woodlands Neighbourhood Forum. The background documents can be seen here on the council’s website. An inaugural meeting of the Forum was held at St Helens Church hall on June 27th 2013. A constitution was adopted and a 10 person management committee elected. There remain 4 places on the management committee and others have come forward since the meeting to express interest in joining the committee. There will be further decisions on membership at the next open meeting (scheduled for September 12th). In future, the new website is where information about the plan will be published and comments can be left. The St Helens Residents Association will continue as a separate body, and will have less need to get involved in the detail of planning issues. Existing members of the association are also deemed to be members of the forum, and will be notified of meetings and consultation sessions. The association had a stall at the very successful St Helens Festival on July 6th. A total of 28 new members signed up to join, bringing our total membership to over 300. This helps to strengthen the voice of the association (and the new neighbourhood forum) on decisions that affect the area. Whether it is on the major plans for developments in this part of London (including the long-term plans for the HS2 transport interchange at Old Oak) or the future of health services in our immediate neighbourhood, there is a lot happening at the moment. Designation of this area for a neighbourhood plan means that detailed work can begin on putting the plan together. This will include a look back at the history of the area, an update of conservation policies, and ideas for ensuring the long term success of the shopping parades and regenerating Latimer Road. We need to gather together everyone’s views on what is good about the area, and what may be threats or unwelcome trends for the future. Please use www.stwq.org or the comments box on this site to feed in your suggestions. After a long wait, designation by Kensington & Chelsea council of the proposed St intin and Woodlands neighbourhood forum is now imminent. An inaugural meeting of the forum has been convened for Thursday June 27th, at 19.30 pm at St Helens Church hall. A leaflet inviting all who live or work in the plan area to come to the meeting (and/or to join the forum) is being circulated to the 1,500 or so households and businesses in this neighbourhood (see map below). At this stage, it is the larger part of the area within RB Kensington & Chelsea that is being formally designated for neighbourhood planning purposes. Hammersmith and Fulham Council has yet to reach a decision on the part within its borough. We hope that the council will ultimately decide the designate this part also. In meantime, membership of the forum is open to anyone living or working in the plan area. There is no charge for membership. St Helens Residents Association has been awarded a grant of £6,760 from the Government, to enable the forum to meet the basic costs of preparing a neighbourhood plan (consultation materials, meeting room hire etc). A new website for the forum has been set up at www.stqw.org. This includes background information and an online membership form. Existing members of the St Helens Residents Association will be deemed to be members of the forum without having to fill out this form. But if you know of other neighbours who would be interested, please encourage them to use the new website and online form to communicate their contact details. In future, news and documents relating to the neighbourhood forum and plan will appear on www.stqw.org rather than on this website. St Helens Residents Association will continue as a separate body, working to improve the overall quality of life in the area. We hope that with the neighbourhood forum taking on the longer-term planning issues, that SHRA will have more time and capacity to look at other concerns such as health services, policing and community safety in the area. After a long wait, formal approval is expected shortly for the start of preparation of a Neighbourhood Plan for this area. RB Kensington and Chelsea are due in May to ‘designate’ their part of the proposed St Quintin and Woodlands area. For a map and more details of these proposals see at this link. The delay on these proposals has not been the fault of RBKC. The proposed plan area extends westwards to Wood Lane, in order to include the triangle of housing around Eynham Road and the Imperial West site. Following a 6 week consultation exercise last summer (when views for and against the proposals were evenly balanced) LB Hammersmith & Fulham has since chosen not to reach a decision on whether to designate that part of the plan area in their borough. So the way forward will be for RBKC to grant approval for the larger part of the plan area (see map below). The process of consulting locally and drawing up a draft plan can then get underway. In the next few weeks we will be circulating all 1400 households, businesses and shops in the plan area with basic information explaining the process. We will be looking for people who are interested in coming together on the management committee of what will be a newly constituted body – the Neighbourhood Forum for this area. We hope that residents and businesses on the LBHF side of the boundary will want to take part in local discussions, and that Hammersmith & Fulham Council will eventually be persuaded to designate their part of the area. In the meantime, the arrangements for the Forum and Plan insofar as they relate to LBHF will be in ‘shadow’ form only. The Government has started a new programme of funding for neighbourhood plans. Over 300 neighbourhoods across England are currently taking the opportunity to prepare such plans. Grants of £7,000 will be available to neighbourhood forums, to meet the costs of holding consultation sessions, and putting together a draft plan. We intend to apply for such a grant when bidding opens on May 1st, so that the new Forum has some resources to progress the necessary work. Membership of the new Forum will be open to anyone living or working in the area. If you are interested in knowing more, or taking an active role in the management committee of this new body, please email to sthelenassn@aol.com. There have been some encouraging decisions from the council in recent weeks, which have shown a willingness to listen to the views of local residents (and this association). Firstly, the planning application from the Alpha Plus Group for Chepstow House School to relocate to 49 Bassett Road has been turned down by the council. Residents in St Marks Road and Bassett Road organised a campaign to point out the drawbacks of a large school coming to a residential street which already copes with the comings and goings at Bassett House School. Potential problems of parking, buses being blocked by parents dropping off and collecting their children, and the daytime noise generated by 240 pupils having ‘staggered playtimes’ in a very small outdoor area, were all brought to the attention of the council. Another factor was that the building has previously been used as a hostel for single homeless, and is classed as a ‘social and community’ building in planning terms. There are all too few of these left in the borough and the right use needs to be found for them. Second was the decision by the council’s Planning Applications Committee that it is ‘minded to approve’ the application by Mountgrange Heritage to continue with their existing presence at 59 St Helens Gardens. Council planning officers had recommended refusal to this application, on the grounds that the building is classed as A1 retail whereas estate agents are A2 (financial services and other business uses). Ward councillors, the association, the neighbouring shops, the church and several other residents had supported the idea of Mountgrange Heritage being allowed to stay put, rather than being forced to leave. We do not want to see the premises becoming vacant again, just when three shop units in this section of the St Helens Gardens have finally been refurbished and let. We also pointed out to councillors that the estate agents have brought back some footfall to a street which has long struggled to find long-term retail tenants. There are presently two vacant shops in the northern section of St Helens Gardens, as well as several in North Pole Road. The committee was persuaded to think again about the recommendation from their planning officers. A final decision will be made at a future committee, and we will be working with ward councillors to ensure wide support for the proposed solution. This is to grant approval with personal conditions attached to Mountgrange Heritage, and to allow A2 estate agency use when coupled with the proposal to install a florists kiosk on the area of private land next to No.59 (normally occupied by a parked car). In this way there should be little risk of a precedent being set in planning terms, and the neighbourhood should get a florists stall to replace Orlando’s (the former tenants of Number 59). All of this should help to secure the viability and vitality of St Helens Gardens. There has been no decision yet on the application for the proposed Crowthorne Road development, which (if permitted) will overshadow Oxford Gardens Primary School and destroy the views south along Wallingford Avenue. We hope that councillors will take account of the many letters if protest from local residents, and ask the developers to scale down the height and mass of their proposals. All in all, we feel that the council is recognising that some of its planning policies can prove too inflexible at times, and need some fine tuning to respond to all sorts of development pressures and finely balanced planning issues. We want to find ways of keeping what is best about this past of North Kensington, while recognising economic realities. We hope that 2013 will bring formal approval to the designation of the proposed St Quintin and Woodlands Neighbourhood Forum, and the chance for local residents and businesses to have a greater say in the future of this part of the borough. The Association’s Annual General Meeting will take place in St Helens Church hall (St Helens Gardens W10) on Thursday 1st November at 8pm. The meeting is open to all members, and to anyone living in the streets around the St Quintin Estate. There will be the usual formal business of electing a management committee and officers for the association. We have a management committee of 12, with two members standing down this year, and please email sthelensassn@aol.com before the meeting if you wish to stand for election. The officers of the association have agreed to continue for a further year, if re-elected. These are: Chairman, Henry Peterson, Vice Chairman Ruth Hillary, Treasurer Maggie Tyler, and Secretary Tania Martin. For the main discussion at the AGM, we want to talk about about the past and present of Latimer Road, and to get peoples ideas for its future. Latimer Road is part of the Freston Road/Latimer Road Employment Zone, within the current planning framework of RB Kensington and Chelsea. The council has recently launched an Enterprise Review, looking at the future of employment zones in the Borough. Fresh thinking is needed, not least because Latimer Road is one of the few parts of the borough where offices and business units prove hard to let. As part of the proposed neighbourhood plan for this area, we feel that Latimer Road could be improved. It currently lacks pedestrian footfall, but this will change when the proposed east west underpass beneath the railway is built. Plans for this project have not been finalised, but £4m of funding is included in the Imperial West S106 agreement. It is understood that the underpass might be built as part of the earlier phases of the construction programme for Imperial West, in the next year or two. So we would like to seek the views of our members on the regeneration of Latimer Road, and how to bring more life to the area. We will be showing examples of how some similar roads and streets in London have achieved a good mix of workshops, offices, studios, and residential, which in turn bring cafes and restaurants to the area (or ensure the survival of those already there). We hope that you can join us for this discussion, Thursday November 1st at 8pm.